Will Medicare Pay for an Electric Wheelchair? Medicare may pay for an electric wheelchair if you qualify. 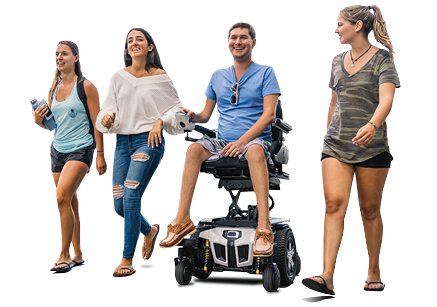 Complex rehab electric wheelchairs, including Quantum® Power Chairs, are usually needed by people who have significant physical disabilities due to birth disorders, injuries, and neuromuscular diseases. Complex rehab power wheelchairs are covered only when they are deemed medically necessary. To qualify, there are several steps that need to be completed. Schedule an evaluation with your doctor or other treating clinician. Prior to ordering an electric wheelchair, a physician or therapist will conduct an in-person evaluation. Your clinician must first consider the use of a cane, walker, manual wheelchair, scooter, and a standard power chair before considering a complex rehab power wheelchair. During the evaluation, the clinician will decide if a complex rehab motorized wheelchair would benefit you and may write a prescription for one. You must have an in-person evaluation and a special prescription from your clinician before Medicare helps pay for a complex rehab electric wheelchair. Have your clinician send the written prescription and your medical records to your authorized Quantum provider. (If you do not have a Quantum provider, you can find one near you using our Quantum Provider Locator.) The provider must receive all paperwork within 45 days from the date of your evaluation. Once your provider receives the prescription and your medical records, they will work with you and your clinician to determine the best motorized wheelchair that meets your needs. Your provider will assess your home to ensure you have enough space to drive and maneuver a power chair. If you have Traditional Medicare (also known as Original Medicare), the primary reason for a mobility aid is to enhance mobility within the home. A provider will consider your ability to perform activities of daily living, such as eating, grooming, bathing, and toileting, with the help of a motorized wheelchair. The home assessment is vital to ensure your living environment can support the use of a power wheelchair. Following a successful home assessment, your provider will order a power chair as prescribed by your clinician. The provider will deliver it to your home and instruct you how to use it.